The United States Football League First Round playoff game at the Houston Astrodome on July 1, 1984 featured the high-powered Houston Gamblers against the defense-rich Arizona Wranglers. Under Head Coach Jack Pardee and offensive coordinator Darrel “Mouse” Davis, the first-year Gamblers operated with a high-scoring run-and-shoot offense that generated the most touchdowns (79) and points (618) of any USFL club. Rookie QB Jim Kelly had phenomenal success, most notably passing for 5219 yards and 44 touchdowns while garnering MVP honors from the league. Wide receivers Richard Johnson and Ricky Sanders ranked first and second among the league’s receivers, with 115 and 101 catches, respectively. Houston could move the ball on the ground, too, as RB Todd Fowler gained 1003 yards with a hefty 5.9-yards per carry average and RB Sam Harrell added another 697 yards. If there was a chink in the attack, it was the 82 sacks the Gamblers gave up. The defense was not nearly as glamorous, but was tough against the run. Overall, Houston had been the most successful of the USFL’s six new teams for 1984, finishing atop the Central Division with a 13-5 record. The Wranglers were a veteran-filled club coached by 66-year-old George Allen. Allen’s teams, most notably the Rams and Redskins in the NFL, were characterized by strong defense and ball-control offense, and Arizona was no different. QB Greg Landry was in his 16th pro season at age 37 and still an effective field general who completed 63 percent of his passes for 3534 yards and 26 touchdowns with 15 interceptions. The tandem of RB Tim Spencer (1212 yards) and FB Kevin Long (1010 yards) was a productive one and WR Trumaine Johnson led the receivers with 90 catches for 1268 yards and 13 TDs. The defense was the best at giving up the fewest yards (250.9) and points (11.3) per game while generating the most sacks (73). DE John Lee was the individual leader in sacks (20). There was a crowd of 32,713 on hand at the Astrodome. They saw the Gamblers put together a scoring drive of 74 yards in the first quarter. Jim Kelly completed four of his five passes for 44 yards and ran the ball three times for another 29 yards that included a 14-yard touchdown. The Arizona defense began to assert itself in the second quarter, however, as two key sacks by the Wranglers forced the Gamblers to settle for field goal attempts, one of which was successful by Toni Fritsch from 38 yards and the other a miss from 46 yards following back-to-back sacks by John Lee and DE Karl Lorch. Just before the half, Frank Corral booted a 32-yard field goal for the Wranglers and the score was 10-3 at the intermission. For all of Houston’s ability to move the ball, the home team had difficulty getting into the end zone. Still, Arizona wasn’t scoring either and, after Fritsch kicked a 22-yard field goal midway through the third quarter and then added another three points from 25 yards out early in the final period, the Gamblers held a 16-3 lead with fewer than 14 minutes to play. Two squibbed punts helped Arizona to come back. 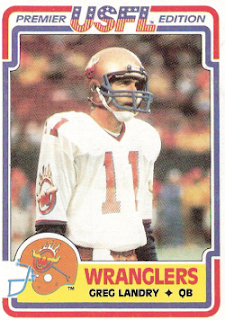 First, a 15-yard kick by Dale Walters gave the Wranglers good field position. They made the most of it as Greg Landry completed a pass to TE Paul Ricker for 28 yards and then Tim Spencer ran 20 yards for a touchdown that, with the successful extra point, put them six points behind with 6:11 still to play. Once again Houston was forced to punt, and this time Walters booted the ball only 13 yards. Landry completed passes to RB Doug Dennison that gained 22 yards and WR Lenny Willis for another 13 before tossing to Dennison again for an 11-yard touchdown. Corral added the critical extra point to provide Arizona with a one-point margin with 1:49 left on the clock. The defense made it stand up and the Wranglers came away with a 17-16 win to advance to the next round. Houston significantly outgained the Wranglers (415 yards to 196), had more first downs (23 to 13), and dominated time of possession (37:15 to 22:45). However, Arizona’s defense held when necessary and sacked Jim Kelly six times while intercepting two of his passes – plus, the two shanked punts in the fourth quarter were disastrous for the Gamblers. Greg Landry completed 11 of 22 passes for 130 yards with a touchdown and an interception. Doug Dennison caught three passes for 27 yards and the game-winning TD while RB Allan Clark topped the club with 43 yards on his two receptions. Tim Spencer rushed for 39 yards on 10 carries that included a TD and Kevin Long was held to 19 yards on 6 attempts. For the Gamblers, Jim Kelly was successful on 23 of 34 throws for 301 yards with no TDs and the two interceptions – he was held without a touchdown pass for the first time all season. WR Scott McGhee pulled in 7 passes for 112 yards and Todd Fowler carried the ball 19 times for 84 yards. Kelly added another 59 yards and a TD on 8 rushes. The Wranglers went on to mount another fourth quarter comeback and defeat the Los Angeles Express the next week to win the Western Conference Championship. Advancing to the USFL title game, they lost to the Philadelphia Stars, which marked the end of Allen’s pro coaching career. The team was merged with the Oklahoma Outlaws to become the Arizona Outlaws in 1985 and finished at 8-10 in the USFL’s final year. Houston reached the postseason at 10-8 but again fell in the first round.